In the process of tracking down a confusing bug in the Snakemake workflow, we used Snakemake's ability to print a directed acyclic graph (hereafter referred to as a dag) representing its task graph. Snakemake prints the dot notation to stdout. When creating the Graphviz dot notation, Snakemake is kind enough to direct all of its output messages to stderr, and direct the dot graph output to stdout, which makes it easy to redirect stdout to a .dot file and process it with Graphviz. But here's the problem: While this is a simple and easy way to generate the dag, it introduces some extra steps for the user, and it also prevents us from being able to print anything to stdout before or after the dag is generated, since anything printed out by the program to stdout will be redirected to the final dot file along with all the Graphviz dot output. So how to avoid the extra steps on the command line, while also improving the flexibility in printing to stdout (i.e., only capturing Snakemake's output to a file)? Can we add two flags like --dagfile and --dagpng that would, respectively, save the task graph directly into a .dot file, or render the dot output from Snakemake directly into a png using dot? We implemented precisely this functionality in dib-lab/eelpond PR #73. To do this, we utilized a context manager to capture output from Snakemake. In this post we'll cover how this context manager works, and mention a few other possibilities with context managers. The context manager defines a runtime context for all the code in the block - and that can be a different context than the rest of the program. When a context is opened (when the with block is encountered), a context manager object is created and its __enter__() method is run. This method will modify the runtime context in whatever way it needs, and the rest of the code in the block will be run. When the context is done, where the block ends, the context manager's __exit__() method is run. This restores the runtime context to its normal state for the rest of the program. It's a general concept with a lot of different applications. We cover how to use it to capture output to sys.stdout below. We mentioned that Snakemake can output visualizations of workflows in Graphviz dot format. For the purposes of clarity we explain what that format is here. 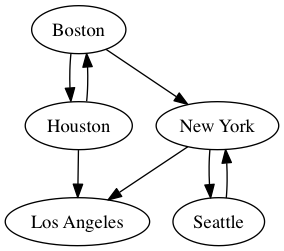 Without getting too sidetracked, Graphviz dot defines a notation for drawing graphs, and provides software for laying out the graphs in rendered images. The user specifies the nodes and labels and edges, as well as formatting and layout details, and dot takes care of laying out the graph. "New York" -> "Los Angeles"
In elvers, the run_eelpond command line wrapper that kicks off the workflow is a Python script that calls the Snakemake API (we covered this approach in a prior blog post, Building Snakemake Command Line Wrappers for Workflows). Most of the code that comes before this API call is processing the flags provided by the user. We want to have the flexibility to print to stdout while processing flags, before we get to the Snakemake API call; and we want those messages to be kept separate from the dag output. In other words, we only want to capture output to stdout between "Begin snakemake API call" and "End snakemake API call". Everywhere else, stdout can go to stdout like normal. We can do this by recognizing that any Python program printing to stdout uses sys.stdout under the hood to send output to stdout - so if we can somehow tell Python to swap out stdout with a string buffer that has the same methods (print, printf, etc. ), run Snakemake, then replace stdout again, we can isolate and capture all stdout from the Snakemake API call. If the user has specified the --dag flag, the __entry__() method should replace stdout with a StringIO buffer within our new runtime context; otherwise, leave stdout alone. If the user has specified the --dag flag, the __exit__() method should clean up by restoring sys.stdout; otherwise, do nothing. Now we are ready to make our context manager object. Any object can be a context manager. All we need to do is add __enter__() and __exit__() methods to an object, and it can become a context manager. In our case, we are capturing stdout from Snakemake so that we can potentially process it, and then dump it to a file. We don't know how many lines Snakemake will output, so we will replace sys.stdout with a string buffer. But once the context closes, we want all those strings in something more convenient, like a list. creating the directed acyclic graph. The constructor is where we process any input arguments passed in when the context is created. Given that we want our context manager to handle the case of a directed acyclic graph by capturing stdout, and do nothing otherwise, we should have a flag in the constructor indicating whether we want to pass stdout through, or whether we want to capture it. Additionally, we don't need to call the parent (super) class constructor, i.e., the list constructor, because we always start with an empty list. No need to call super().__init__(). # Boolean: should we pass everything through to stdout? When we open the context, we want to swap out sys.stdout with a string buffer. But we also want to save the original sys.stdout object reference, so that we can restore the original runtime context and let the program continue printing to stdout after Snakemake is done. # a StringIO object that will save stdout. To clean up, we will need to restore sys.stdout using the pointer we saved in __enter__, then process the string buffer. We can also use the del operator to clean up the space used by the buffer object once we've transferred its contents. Close the context and clean up. exception (we don't deal with those here). # lines from our StringIO object). # it was before we opened up this context. # to stdout instead of to a file). # without capturing any of it. Once we have closed the runtime context, our variable output is a list with all the output from Snakemake (assuming we're creating a dag; if not, everything is passed through to stdout like normal). The last bit here is to handle the three different dag flags: --dag, --dagfile, and --dagpng. The final code is implemented in the cmr_better_dag_handling branch of eelpond/elvers and pull request #73 in eelpond/elvers. Now we're ready to run the workflow. We can use the -w flag to list all workflows, then use the -n flag to do a dry run. reflect the order of execution. Added default parameters from rule-specific params files. Note that you can add a line rankdir=LR; to your dot file to change the orientation of the graph (left-to-right order makes highly-parallel workflows vertically stretched, so they are eaiser to view). Actions requiring temporary contexts, which are a bit like self-contained workspaces, are good candidates for context managers. Following are a few examples and references. (Note: this blog post uses a context manager that is a generator decorated with a context manager utility function; this is a different approach than our class-based approach but is still valid. iPython notebook and matplotlib figure management: Camille Scott has a blog post covering a way of managing large Jupyter notebooks with lots of figures using context managers. In this case, the context that is being set up and torn down is a matplotlib plot context, and it is creating each plot, saving it to a file, then closing the plot. This makes the notebook a lot faster than trying to render every single plot, and makes it a lot cleaner than littering the code with manual figure and axis management. Database Connection: this example comes from Django's test suite. In it, a context manager is defined that creates new MySQL database connections when the context is opened, and closes them when the context is done. The first two lines of this function are equivalent to an __enter__ method, while the last line is equivalent to an __exit__ method. The context manager is a convenient way of creating a copy of an existing MySQL connection, then closing it when the requesting method is finished using it.